Railings can be elegant, stylish and add an element of charm to your home. It’s also important to remember that guardrail safety is an important aspect of your stair design. When properly placed on the outer edge of a flight of stairs, deck or the perimeter of a stairway, guardrails ensure safety and protection. To avoid accidents, your railings should not only be stable and secure but carefully measured. To ensure the utmost safety of your guard rails, they need to adhere to official safety code requirements. 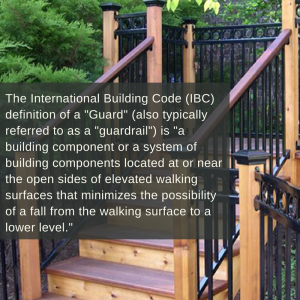 Residential railing must adhere to the safety code of the International Building Code, or IBC. One or two family homes with three stories or less fall under this particular code. This stand alone document is updated periodically and addresses every aspect of home construction. Some of the most important specs that you should pay attention to in regards to your railings are the height, sizing, opening and the space between the balusters. Open walking surfaces that are higher than 30 inches must have a guardrail. If you have an open-sided surface, your guardrail must be 36 inches and measured horizontally. Interior sections of open guardrails must not have an opening wide enough for 4 inch sphere in diameter to pass through. Components that fill in the railing like the balusters and panel must withstand a normal load of 50 pounds. For the full list of requirements. Please read the entire code HERE. Although it’s not something that we think about every single day, never underestimate the importance of railing safety. Railing can add beauty and style to any home, but its primary function is safety. Railing can help people balance better, prevent falls, increase safety during inclement weather, aid with help when carrying a heavy load and provide general comfort and peace of mind. Stair Solution is a leading provider of world class railing systems. We take pride in offering beautiful, functional and safe stair solutions. 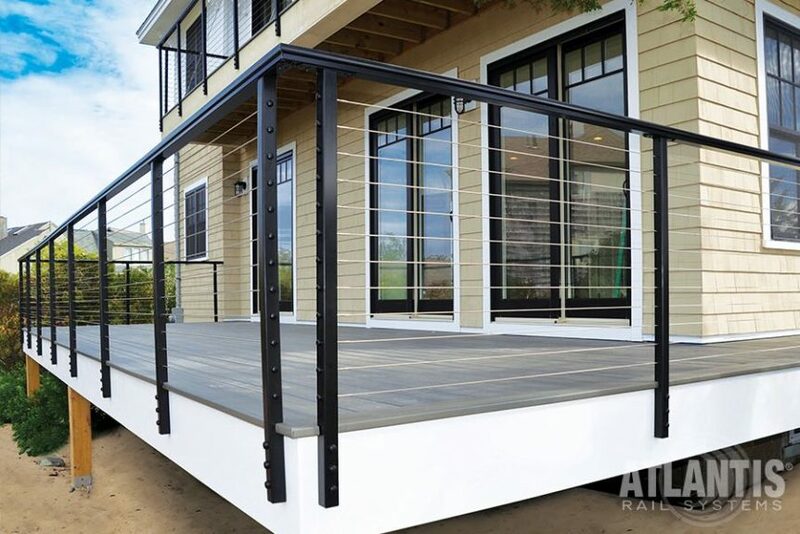 Whether you are looking for exterior handrails or an entire system for your deck, you can rest assured that our systems are safe and beautiful. Contact us today for all of your stair needs.